A Year of Being Here: Ellen Bass: "The Thing Is"
"The Thing Is" by Ellen Bass, from Mules of Love. © BOW Editions, Ltd., 2002. 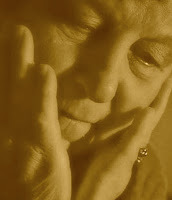 Photograph: Detail from "Elderly Woman Holding Hands to Face," by Image 100 (originally color). The analogy of grief is in a strange way comforting, and anyone having felt it can relate to this. It would be good to know this in the midst of it.